Explore Freedom » Hornberger's Blog » How Much Is an Iraqi Life Worth? How Much Is an Iraqi Life Worth? One of the most morally obscene aspects of the Iraq War has been the cost-benefit analysis in which war proponents claim that the war has been worth the hundreds of thousands of Iraqi people killed in the operation. Since the U.S. government has brought democracy to Iraq, the argument goes, the deaths of countless Iraqi people, while regrettable, has been worth it. I imagine that there are more repugnant positions, morally speaking, but for the life of me, I can’t think of any. In fact, ever since the invasion of Iraq I have found it absolutely astounding that Christian ministers all across the land have exhorted their congregations to pray for the troops in Iraq, knowing that such troops were killing Iraqi people. Would they have done that if the troops were committing abortions in Iraq? 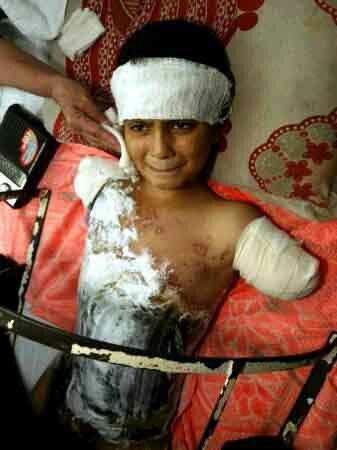 Take a look at this photograph of Ali Ismail Abbas, a small boy who lost both his parents, including his pregnant mother, and both his arms when two American missiles slammed into their home during the U.S. invasion of Iraq in 2003. Iraq War proponents say that Ali’s loss of both arms and both parents have been worth it — that is, worth the effort to bring democracy to Iraq. Can you think of anything more morally repugnant than that? The lives of the Iraqi people didn’t belong to the U.S. government and, therefore, the U.S. government had no right to sacrifice them in the process of attempting to bring democracy to Iraq. No one can place a value on the life of another person. Yet, that’s precisely what U.S. officials have done and continue to do. They’re saying that the lives of countless Iraqis were worth less than the value of achieving democracy in Iraq. How do they arrive at that cavalier calculation? I don’t know. But it has to be among the most morally repugnant calculations ever made. In fact, I find it fascinating that so many Christians who eagerly condemn Muslims, Islam, and the Koran, claim that there is nothing wrong with sacrificing the lives of other people — countless other people — for the sake of a political goal such as democracy. How do they reconcile such a position with Christian principles? In the eyes of God, every single person’s life is sacred, whether he is Catholic, Protestant, Jew, Muslim, Hindu, Buddhist, atheist, or agnostic. God does not permit one human being to kill another human being for the sake of achieving democracy in other country. It is this fundamental wrong that all too many Americans have yet to confront — that their government, operating through its military and paramilitary forces, has broken God’s sacred commandment against killing with its invasion of Iraq. The war was always about regime change, pure and simple — one intended to oust Saddam Hussein from power and install a U.S.-approved ruler in his stead. After all, if the invasion was really about democracy-spreading, would the U.S. government have supported such non-elected rulers as Saddam Hussein himself (during the 1980s), the Shah of Iran (until he was ousted by the Iranian people in 1979), Pervez Musharraf (the unelected military dictator of Pakistan until the Pakistani people ousted him in 2008), and many other non-democratically elected rulers around the world? The U.S. government attacked and invaded Iraq, not the other way around. That makes the U.S. government the aggressor power in the conflict and Iraq the defending nation. The U.S. war on Iraq was a war of aggression against the Iraqi people, a type of war that was condemned as a war crime at Nuremberg. The situation is aggravated by the fact that it was waged without the constitutionally required congressional declaration of war, making the war illegal under our form of government. Most important, the U.S. government had no legitimate authority to sacrifice even one Iraqi life — not one single Iraqi life — for the sake of democracy in Iraq. The U.S. government’s sacrifice of the Iraqi people at the altar of democracy violates the principles of every major religion, including Christianity, Judaism, and Islam.